Swiss precision — and competitiveness. 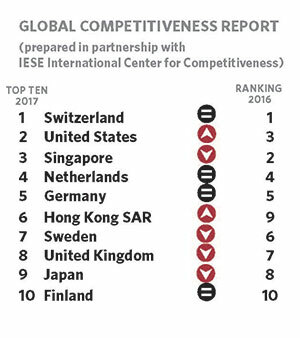 For the ninth year running, Switzerland was ranked the world’s most competitive economy by the World Economic Forum’s Global Competitiveness Index (GCI), scoring 5.86 points on a scale from 1 to 7 — climbing even higher than its chart-topping 5.81 points last year. The country’s strong results were evenly balanced across the 12 pillars of competitiveness measured. The United States could not have been a closer No. 2 this year, with 5.85 points. Meanwhile, Singapore fell to third place, with 5.71 points (down from second place last year, when it logged 5.72 points). The Netherlands and Germany stayed in their places, ranking fourth and fifth, respectively. The WEF’s annual ranking of 137 economies, accounting for 98 percent of world GDP, defines competitiveness as the factors that drive countries’ productivity and prosperity. Good news aside, approaching the 10th anniversary of the global financial crisis, this analysis warns that many of the world’s economies remain at risk from further shock and are ill-prepared for the next wave of innovation and automation. Along with its GCI ranking, The Global Competitiveness Report 2017-2018 delves into the world’s current economic progress and future challenges, homing in on three areas of greatest concern. First, the financial sector still looks vulnerable in many places. Second, while more countries have been able to innovate and advance technology, they still need to do more to spread its benefits — especially in emerging economies, like China, India and Indonesia. Finally, on the brink of a new technological revolution, dubbed the Fourth Industrial Revolution within the WEF, both labor market flexibility and worker protection are needed. “With vast numbers of jobs set to be disrupted as a result of automation and robotization, creating conditions that can withstand economic shock and support workers through transition periods will be vital,” the WEF’s press release states. “A decade of data illustrates the importance of balancing flexibility with protection in labor markets and why big, hoped-for gains in productivity from innovation have remained elusive.” The report underscores the need to boost innovation with labor reforms and other key changes. Professor Pascual Berrone and researcher María Luisa Blázquez of IESE’s International Center for Competitiveness (ICC) serve as collaborating members for the WEF, covering Spain for the compilation of the report. They note that Spain improved its score from last year, inching up from 4.68 to 4.70 this year. That said, in the ranking Spain dropped two spots — from 32nd to 34th — as Chile (4.71 points) and Thailand (4.72 points) pulled ahead. Spain’s strong points continue to be its infrastructure, for which it placed 12th among the 137 economies. Air transport, railroads, ports and roads all receive high marks. Another bright spot is Spain’s higher education and training, with high marks for management schools and enrollment rates in secondary and tertiary education. There remains much room for improvement, too. According to the GCI Executive Opinion Survey, “inefficient government bureaucracy, tax rates, and restrictive labor regulations” are the most problematic factors, dampening innovation and productivity. Within the top 10, Hong Kong SAR was the biggest gainer, climbing three spots to sixth. Hong Kong boasts the world’s very best physical infrastructure and the second-highest score for efficient markets, based on its healthy competition and openness. Elsewhere in Asia, Japan ranked 9th while China climbed one spot to 27th. At 40th place, India remained the most competitive country in South Asia. 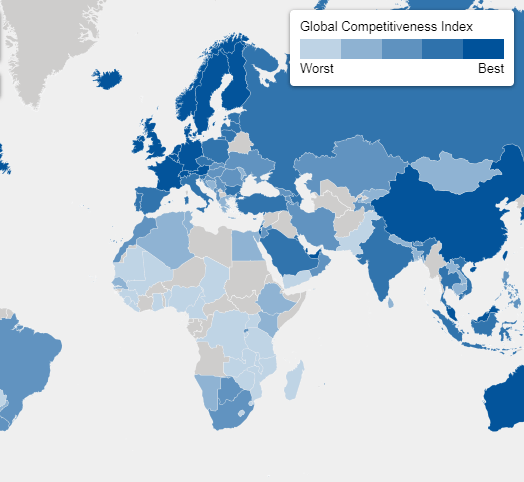 The WEF’s Global Competitiveness Report has ranked economies based on its Global Competitiveness Index (GCI) since 2005. GCI rankings for 137 economies are evaluated according to 12 pillars (i.e., categories) of competitiveness. They are: institutions, infrastructure, macroeconomic environment, health and primary education, higher education and training, goods market efficiency, labor market efficiency, financial market development, technological readiness, market size, business sophistication, and innovation. Various indicators for each pillar are scored based on statistical data (from internationally recognized organizations) as well as perception data, which comes from the GCI’s Executive Opinion Survey, one of the largest executive studies of its kind with thousands of respondents. Full details are available in the report.